1 of 5 In medium-size bowl, whisk together the 3-1/2 cups flour, baking powder, salt, cinnamon and nutmeg. Set aside. 2 of 5 In large bowl, lightly beat yolks on medium speed. Gradually add granulated sugar, beating until pale and slightly thickened, about 3 minutes. Mix in butter. Add flour mixture alternately with milk, stirring with wooden spoon until combined. 3 of 5 On well-floured surface, with floured rolling pin, roll dough into 1/2-inch thickness. Let rest for 15 minutes. 4 of 5 Meanwhile, heat oil to 365 F (a cube of bread will be browned and crisp after 1 minute) in a heavy-duty saucepan over medium-high heat. 5 of 5 Cut into doughnuts with 2-3/4-inch round cutter along with 3/4-inch round cutter for the centers. Gather scraps and re-roll if needed. 1 of 1 Place cinnamon-sugar in a small bowl. Carefully slip the doughnuts and doughnut holes, 3 or 4 at a time, into the hot oil. Fry until golden, turning once, about 2 to 3 minutes total per batch. 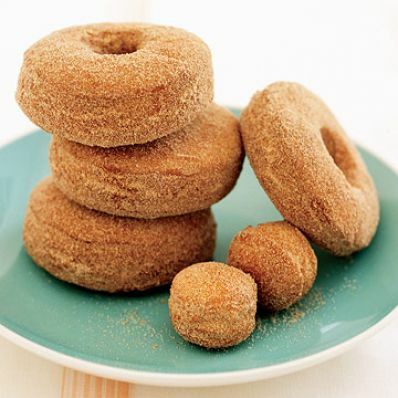 Drain doughnuts on paper towel, then transfer still-warm doughnuts to cinnamon-sugar coating and roll to cover completely. Serve warm. Per Serving: 2 g sat. fat, 3 g pro., 31 g carb., 12 g Fat, total, 39 mg chol., 1 g fiber, 214 mg sodium, 248 kcal cal.